Thank you for visiting my website "Kodama Forest". 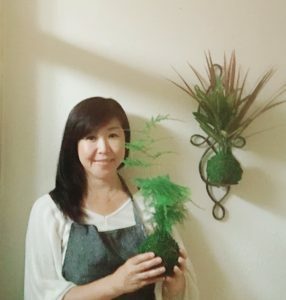 Kodama means "forest sprits" in Japanese words and this business name was chosen because I wish all my kokedama deliver the peaceful forest spirits to new owner of the kokedama and he or she to share the peaceful world to their family and friends. To expand my dream, I hope my work help to create peaceful earth. I depict kokedama as small earth with little forest plants and I hope everyone enjoy the forest spirits and energy this moss-ball produce. All kokedama is hand made by myself thinking about people's smile, using the best mixture of soil for each plants' requirement, and they are wrapped with green preserved moss. I will accept custom order, please contact with me if your favorite plants can be transform to Kokeama, the little earth ball. Kokedama (Ko Kay Da Ma) is unique form of Japanese art utilizing live plants. Similar to Bonsai, Kokedama is a new art form that has become prominent in Japan. While Bonsai is comprised of small trees which are artistically formed, Kokedama involves both indoor and outdoor plants; varying from household plants to wild flowers to create a unified theme. Kokedama is a peaceful art form, which due to its small and portable size, can be displayed indoors. Kokedama has known in Japan as casual horticulture arts but it is still not too popular. It is beautiful living art which gives peaceful and calm mind to people. I would love to contribute my time to keep this new Japanese tradition and hopefully become popular plants art so that it will pass on to future children. My wishes with this Kokedama plants is that every owner enjoy and maintain the peaceful mind and energy that this small forest spirit ball produces.